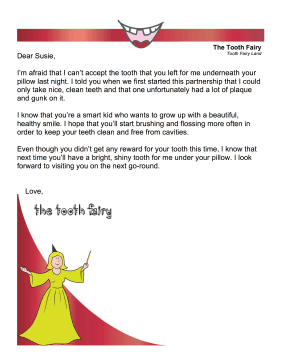 If a tooth is rotten or has a cavity, use this printable tooth fairy letter to reject it. I'm afraid that I can't accept the tooth that you left for me underneath your pillow last night. I told you when we first started this partnership that I could only take nice, clean teeth and that one unfortunately had a lot of plaque and gunk on it. I know that you're a smart kid who wants to grow up with a beautiful, healthy smile. I hope that you'll start brushing and flossing more often in order to keep your teeth clean and free from cavities. Even though you didn't get any reward for your tooth this time, I know that next time you'll have a bright, shiny tooth for me under your pillow. I look forward to visiting you on the next go-round.